Q. We have a TimePilot Extreme. Our hard drive died and we lost the transactions we collected and imported into TimePilot Central yesterday. Is there any way to get that info back? Open your Extreme Data Manager by going to Start > All Programs >TimePilot IV >TimePilot Extreme. Within the Extreme Data Manager, right-click the clock you want to retrieve previous transactions from and choose Station Properties > Advanced. Insert your USB Drive into the computer, then enter the number of transactions you would like to retrieve and select Get Transactions. How many should you ask for? Calculate how many should have been generated and add 10% or 20% more as a safety margin. Don’t worry—duplicate transactions won’t be a problem. When prompted, remove the USB Drive from the computer, insert it in your Extreme clock and tap the Management iButton to the clock’s IN probe. Once that operation is complete you can bring the USB drive to your computer and import the transactions as you normally would. Q. I keep hearing about “the Atomic Clock.” What is it and does TimePilot use it? A. An Atomic Clock measures time in relation to the movement of atoms. The device commonly referred to as “the Atomic Clock” is located in Boulder, Colorado, and is operated by the National Institute of Standards and Technology (NIST). It keeps the official U.S. time and is expected to neither gain nor lose a second in nearly 20 million years. The time calculated by the clock is broadcast daily by radio signal from Fort Collins, Colorado, to much of the U.S. NIST also distributes it via the internet. Many clocks that are labeled “Atomic” actually just have a radio receiver attached. If the NIST radio broadcast is received by the receiver, the clock updates itself to the correct time. We say “If” in the preceding sentence because receiving the signal is not guaranteed. If your clock can’t receive the signal—if it’s blocked by a few walls, near a computer monitor, in a building with a metal roof or atmospheric conditions aren’t just right—it may not receive the signal. If your radio-equipped clock isn’t getting the signal, NIST advises that you unplug it, take it outside at night and plug it in. You might get a signal then. We don't think that's practical for a timeclock system. Instead of a radio receiver, TimePilot’s clocks get their time from the clock in your computer or server. If you’re connected to the internet, your computer’s clock gets its time from NIST’s internet service and updates automatically. We believe that's far more reliable, and it allows you to place your clocks anywhere. Who turned out the lights? If the sun stopped shining suddenly, it would take eight minutes for people on earth to be aware of the fact. Who's taller: Grandfather or Grandmother? A Grandfather Clock is a tall clock over 6 feet in height. A Grandmother Clock is 6 feet or under and a Granddaughter Clock is less than 5 feet. TimePilot Q&A: Retrieving lost transactions; all about the Atomic Clock. Lead story: Moving TimePilot to a New Computer. 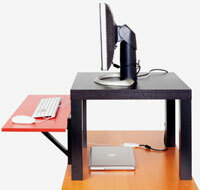 Cool Stuff: Get Healthy: Building Yourself an Inexpensive Stand-Up Desk. The Deal: 25% Discount on 1-Year Technical Support Agreements. Before you start the installation, if you have your TimePilot database on your old computer and want to move it to the new one, copy the folder on the old computer that contains the TimePilot data to a USB drive and paste it onto the new PC’s hard drive. See the box at right to learn where to find the database folder. If your database is on a server, skip this step and go straight to Step 2. One year of TimePilot technical support, by phone or email. Sitting at your desk for more than three hours a day will cut your life expectancy, according to experts. The solution: a standing desk. You can buy specially-made standing desks for hundreds of dollars, or you can build your own solution that rests atop your current desk for just $22 in parts from Ikea. The parts are available from Ikea's web site as well as at Ikea stores. The designer calls it the "Standesk 2200." It's simply an end table with two brackets and a shelf attached to it. Here's a link to the instructions. Be sure to read the comments at the bottom of the article: They're full of comments that improve the design.